David A. Andelman, visiting scholar at the Center on National Security at Fordham Law School and director of its Red Lines Project, is a contributor to CNN where his columns won the Deadline Club Award for Best Opinion Writing. Author of “A Shattered Peace: Versailles 1919 and the Price We Pay Today,” he was formerly a foreign correspondent for The New York Times and CBS News in Asia and Europe. Follow him on Twitter @DavidAndelman. The views expressed in this commentary are his own. (CNN) China is digging in for the long haul. And President Donald Trump had better start thinking about an exit strategy from a trade war that is showing no signs of easing. The shaky Chinese stock market isn’t going to help him — it will only destabilize the US stock exchange, which many Americans rely on for their retirement funds. 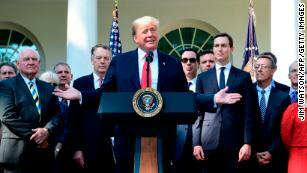 The President has blamed the whipsaw American stock markets on the Federal Reserve hiking interest rates. 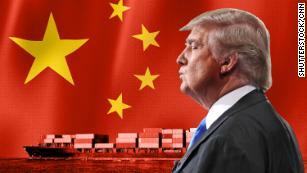 But much of the blame must also fall on now deep-seated uncertainties on the trade front, as the United States prepares to ratchet up tariffs on Chinese goods. Moreover, most Chinese leaders don’t seem at all willing to play ball with Trump. In fact, they’re not even answering the phones. 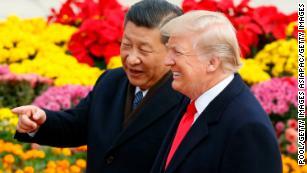 Though President Trump is counting on a talk with Chinese President Xi Jinping at next month’s G-20 meeting, China is beginning to show evidence of playing a very long game. Early on Tuesday in China, the Shanghai Composite Index shed 2.26%, and the Hang Seng was down 3.08%. But when the New York Stock Exchange opened, the Dow plunged more than 540 points before recovering a bit. At one point on Tuesday, the Nasdaq index was posting its worst month since November 2008, during the depths of the last recession. The fact is the Chinese stock market has been among the world’s worst performers for much of this year, though at one point this week the US market lost all its gains for the year. Still, any impact of Chinese stocks on the broader population is minimal compared with the United States. Barely 9% of all Chinese household assets are in stocks — one-fifth of the amount in the US — while 72% of Chinese savings are in cash. By contrast, at least 54% of all Americans own stocks. That number has declined over the past decade, according to Gallup, but it’s still more than five times the percentage of stock ownership in China. And many of these Americans, for better or worse, are betting their retirements funds on the health of the market. What if Trump’s confrontational trade stance actually works? Of course he hasn’t. This is not a negotiation over a new real estate or casino project. “The Apprentice” might have a resolution in 52 minutes, but China has been prepared to wait out its adversaries for hundreds of years. This time is no different. On the American side, however, growth has begun to cool. Forecasts for this Friday’s quarterly GDP performance numbers suggest a 3.3% growth rate, down from 4.2% in the last quarter. Trump sees a 4% growth rate as fabulous, and a tribute to how hot the economy, along with the jobs market, has been under his presidency. Moreover, with the largest group of tariffs just hitting in September, the real impact on the American economy may still be down the road. Unsurprisingly, the Chinese are happy to sit still and watch. First, a hot US growth rate is essential for Trump to have any chance of offsetting the cost of his huge corporate tax cut. But there is a big downside here. To curb inflation that so often accompanies such high-octane growth, the Federal Reserve will have to keep raising interest rates. That’s a definite disincentive for stock investors, who will begin to find higher yields in bonds than stocks, driving the stock market even lower. These higher bond yields are a boon for investors who may be buying US securities that have to be sold to finance America’s ballooning deficit — a direct product of the Trump tax cuts, narrower than hoped growth, among other factors. And China is still one of the biggest buyers of American bonds. All this gives China huge leverage that it hasn’t really even begun to exploit. First, it could start paring down its purchases of new American bonds, forcing the Treasury to offer even higher interest rates to sell them to other buyers. While it’s unlikely China will begin selling the nearly$1.2 trillion in US treasuries it holds and crush that market as a result, some analysts warn it’s not an impossible scenario. Indeed, in August, the most recent month available, Chinese holdings of treasuries did pare back to $1.165 trillion from $1.171 trillion, the first such monthly reduction, though it’s unlikely that this was driven by anything other than routine currency settlements, at least for the moment. There is also any number of other weapons China hasn’t yet utilized to do battle with the United States in any prolonged trade war. Imagine, for instance, a boycott-America movement among Chinese consumers — among the world’s largest buyers of the iPhone and other Apple products, not to mention American cars, machinery, aircraft and a host of luxury consumer goods. It’s a tactic China has certainly put to use before in dealing with other countries with which it’s had trade disputes.